Nadex (North American Derivatives Exchange) is a US-based, retail-focused, CFTC regulated exchange that offers binary options, call spreads and Touch Brackets, making it our top choice for US traders. Nadex is owned by IG Group, a prominent international provider for CFD trading, Spread Betting and Share Dealing. The company headquarters are based in Chicago, Illinois and subject to US law. Nadex’s legal information is completely transparent and easily available on their website. Nadex is a US exchange regulated by the Commodity Futures Trading Commission (CFTC). Nadex is NOT a scam, but the real thing. For further reference, see the CFTC Fraud Advisory announcements on Binary Options. Strongly Recommended: Nadex is a CFTC(US) Regulated Binary Options Exchange Open an Account Now!. Nadex is one of only a few legally operating, CFTC designated, binary options exchanges based in the US (Cantor Exchange is another worth mentioning). This means a number of things for both US-based and international traders (Nadex accepts accounts from various countries around the world). First and foremost, it means CFTC oversight, secure withdrawals and access to all the top assets you have come to know and love. Should I Open an Account with Nadex? Nadex Binary Options are financial instruments that turn every trade into a simple question: will this market be above this price at this time? Binary options are based on the 0-100 model and are bought and sold in lots. This means if a trade expires OTM, it is worth nothing. If a trade closes ITM, it is worth $100. Please note that your profit or loss is reflective of what you paid to place the trade, including fees. You can click here for more on how to trade Nadex Binary Options. Nadex Call Spreads are a single contract with a floor and a ceiling range. The floor represents the lowest level the contract can trade, and the ceiling represents the highest level a contract can trade. We think call spreads trade like spot Forex but have training wheels in the form of profit/loss limits, but it’s the binary return options that we are here for. 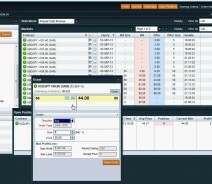 Nadex Touch Brackets enable you to make trades based on price action within a predefined price range. Each contract has a floor and a ceiling offering a natural price target with known risk and reward. Touch Brackets track the movement of the underlying market price. If the Nadex Underlying Indicative Index touches either the floor or the ceiling of the Touch Bracket, then the contract expires immediately. That way you know maximum profit targets and the maximum risk if your trade goes against you. And, you can always place an order to close a position prior to expiration. The asset list at Nadex is pretty good. Not as large as others I have seen, but the good news is that it is growing all the time. There are currently 8 major indices, 10 Forex pairs, 7 commodities, 1 cryptocurrency, and 3 Economic Events contracts to choose from. Indices include the major US, European, Japanese and Chinese markets. All the major Forex pairs are represented, as well as commodities including gold, silver, copper, oil, natural gas, soybeans, and corn. The only cryptocurrency is Bitcoin. You can trade quite a few markets in short-term five and twenty-minute binary options contracts. Expiry is where you might get a little confused but don’t worry, it’s not too difficult to understand. Each asset has a list of set expiry times which can range from 5 minutes to intra-day, to end of day and end of the week. You can hold your binary options until expiry and get your expected return, or you can sell it at any time beforehand that you choose. Nadex binary options are completely tradable, so long as there are willing buyers and sellers, which is similar but far more advanced than Early Out or Close Now features you find elsewhere. Nadex entered the cryptocurrency market with the addition of Bitcoin Call Spreads. So far they only have two Bitcoin contracts, one with a weekly and one with a monthly expiry, but we expect to see them add more as cryptocurrencies gain wider acceptance. The call spreads are a bit different than the standard binary option, but still, are very easy to trade. You can sell your position to lock in profits or cut losses at any time you want. The name “spread” comes from the fact that there is an upper and lower limit to prices, that is the spread. The limits cap gains and losses, but profits are based on the amount of pip movement in the underlying asset. Nadex gets its share of complaints, but which exchange/broker doesn’t. The difference is that complaints here are from traders who aren’t allowed to join, traders who fail to understand the system and traders looking for more services. What you don’t find are complaints about scams, shady withdrawals or fraud. One common complaint I find is that there aren’t enough assets. The number one complaint is that it’s not as easy as CySEC style options, but that doesn’t matter now as CySEC options aren’t the same as they used to be. Nadex does not offer any promotions or bonuses at this time. In the past, they have run some limited fee-free promotions. Nadex has fast withdrawals. They can be made by wire transfer or ACH transfer (US Only) to your bank account. All withdrawals are processed within one business day and returned to your account within 3-5 business days. If you funded via debit card, to make a withdrawal you will first have to send in bank account verification documents, including a bank statement with your name, account # and a transaction to Nadex shown. It’s a pain, but trust me, it’s worth it for fast, secure withdrawals and its meant to protect you. Nadex extra’s includes Event Binaries, Call Spreads, and Touch Brackets. Also, their NadexGo app is a great platform to trade on. Event binaries are options on economic events like the weekly jobless claims and monthly NFP numbers. Call spreads are like binary options in that they have a max and minimum payout, but trade like forex with profit counted in pips while the asset price is within the “spread”. Other features include 100% tradability as in you can buy or sell whenever you want and are not limited to holding until expiration. Nadex Touch Brackets are a combination of a spread and range option that trades just like a forex pair, except it is automatically expired if the upper or lower boundary is reached. Sounds just like the call spreads except with automatic expiry when the trade maxes out. The micro-lot sizes of Touch Brackets provide flexibility to trade with low capital requirements. The Nadex mobile platform, NadexGo, is great. It is a Progressive Web App (PWA) that automatically updates itself in real time, so it is always functioning at its best. It includes charts, trading, and more. It’s fast, intuitive, and well-designed. This is not the most user-friendly platform you will find. First off, it is not that simple to join. When you get on the platform you will find navigation a little confusing, but once you get a grip on it you will have no trouble with using Nadex trading platform. And, if you are like me, you will like it a lot. Nadex doesn’t have too many assets, but it does have all the ones that matter most: 8 indices, 10 currency pairs, 7 commodities, and 1 cryptocurrency. Plus you can also find economic event contracts, which I find to be a lot of fun. Additionally, new assets are being added regularly as the market calls for them. Nadex has another difference from other brokers/exchanges – it charges small fees… but they are really low compared to what CySEC-style brokers keep when you profit. Nadex charges a $1.00 per side, capped at $50.00 per side. If you hold the position until expiration and it closes OTM (zero), then you will not be charged a settlement fee. Support is really good, they have a full staff available to answer your questions and help get you started. Effective returns can be really good, too. Nadex is the best exchange for any traders to deposit with (they allow accounts from various countries all over the world). Payments are fast, usually made within a few days of your request, provided the funds are available within your account and there are no verification issues to tie up your account. There really isn’t one thing specifically that is extra about this exchange, except for the whole thing. For one, it’s not a “broker”, it’s an exchange. It has a vested interest in providing safe and legitimate trading because it is in business to provide the platform, not to take the other side of your trades. For another, the freedom for you to buy or sell whenever you want makes them infinitely more flexible than any other binary broker on the market. Trading with Nadex allows you to potentially increase your profits while keeping your risk always under strict control. The options acts more like stocks than stock options. Stock options have intrinsic value when short sold. The value of the position will grow when the position moves in the direction of the trade. If you are into trading short selling or buying for credit, this may not be for you. However, If you are a directional trader and don’t have much cash, this is the place to be. Seems like no matter whether i sell or buy and win i bet all my balance and always only end up with a few thousand less than i started with, am i missing something? It sounds like you are buying (or selling) options that are already in the money, and paying more than $50 per contract. Your profit on the binary options are always $100 less the amount you paid for it. The only way to double your money each time is to only pay $50 per contract. There is a vast difference between trading the NADEX demo account and the live account. The spreads on the live account are not as wide as those on the Demo platform. Many so called signal sellers demonstrate their winning ability on the Demo platform. I have found unusual results trading on NADEX. Try going as far away from the indicative index as money is available (bid/offer). The chart would linger for awhile and then miraculously move up pass your bid/offer position wiping out the trade, and never move in the opposite direction until the trade is over. As if someone monitors the trade and pumps money in to oppose your trade. Happens to me every time in Demo. I’d never try it with a live account. Very good review on NADEX . Amazing site! Martin, I took your advice and made a deposit on NADEX , so far looks really good! Here is my first ever expeirence with Broker in 4years.This is completely true that NADEX service is not very good and not trusty platform. 2 days back they suspend my account instead of clearing and helping with my solution. No any other Broker in the world do this. I have TD Ameritrade they are so very nice they help me and answer my every doubt. My NADEX account is from 2 years and not make any deposits because of learning of about stock markets. I tried to make but it failed everytime, i told them about it & in 3rd email they drop a sudden email with a message that Indian Residents are not allowed to trade. And even after 3 days my friend account is running and he has no deposits. So beware with that. dont be easy. yes you can only recover your account with by meeting with CEO of Nadex.there are excellent platform in the world why to go back. Trading with NADEX carry 0 risk. Its the only real binary option broker for US cizitizens. They have a really good platform and very good customer support. I give them 100! Nadex is not a scam: leave that comment for coinbase. I have deposited 10,000 dollars and have made a nice profit in a couple of months. I have had no issues with withdrawals and the tax info came as expected. Being regulated matters. If you are financially stable to start with and have a well defined strategy for trading these types of options than NADEX delivers as promised. Very Disappointed in the Customer Service. The article mentions that some people are not allowed to join Nadex. What disqualifies someone from utilizing Nadex? I’ve traded Nadex binary options for over 3 yrs. I know of nobody profitable long term, meaning ask them how they’re doing after 12 months. Nadex binaries are legit, but you’ll have wild swings in your acct and at the end getting very little for your time. The Nadex market makers change, thus the pricing changes, in their favor. The majority of the time that’s who you’re trading against. A few yrs ago you could easily collect $20 premium on both sides of a 80 pt wide butterfly (sell the top strike and buy the bottom), made a lot of money, but those wide pip spreads are long gone as the M/M stopped offering them because they where losing. Keep in mind, Nadex is still relatively new with not many traders. It’s been said the avg Nadex acct is only $600. Nonetheless, I’m hopeful Nadex will continue to grow. Difficult to withdraw my money from my own account..
Associates are not very friendly or helpful. Instructions are given in a fractured manner, demanding more & more documentation. Customer Service must be pretty busy because they all attempted to force me off the phone. I know I appear to be a small account today, but that was not the plan. Disappointed in the Customer Service. There is a market maker. 22 years in this industry makes me think it’s a bad idea to get overly involved. Be cautious. Since very first moment I’m in favor of this platform, fantastic education material and very simple trading. Thank you! I have been trading on the Nadex Platform for about 6 months and have deposited a couple thousand dollars. OK so im not that good. I recently have had a returned ACH Deposit for 100 dollars. They immediately took out 125 dollars from my account Plus took back another 100 that was waiting to be cleared. At the end of current trades that day i was left with 101 negative in my account. Since then $100 cleared that was pending so left me with with a negative balance of a little more then $1. A week later I called to be able to make a deposit so i can bring the account to a positive amount. They lifted the ACH hold and allowed me to make a 100 deposit that took 5 days to clear. Now my account is 98.95 in the positive. So here is my problem my account is still on hold based that i needed to deposit 100 plus 25 to cover the returned ACH. They have received $200 in deposits since then. I am also told that i can not withdraw the remaining balance either because my account is on hold. So anyone saying they do not have complaints about withdraws and deposits here you go. The Policy they explained to me from customer service just does not seem fair especially since they received the funds to clear the returned ACH and the $25 dollar fee. I would also note they do not accept My Debit card as well Witch makes it very inconvenient. Why do they ask for my social security number when registering online? WRONG! If it ITM, it based on Sell price which is average 10 belows Buy Price. You will never get $95 to $100. And, your offer, is only going to be based on Buy Price. The federal regulation should look at FINRA law over the word “misleading” and apply it to NADEX. But, then again, NADEX want to disclaims risk and loss of money to loophole their front page misinformation. Do you dues diligence, not what NADEX “says”. You are wrong, sir, and misleading the readers. This website is correct. The contract IS worth $100. But you are paid the difference between what it’s worth and what you paid for it. So, if you paid $40 for the contract, then you will receive $60. If the contract finishes ITM then it’s worth 100. If you pay 40 for a contract then 40 is deducted at the time of purchase. When the contract expires if you’re ITM then they credit 100 to your account. You loose the 40 whether you win or loose. Therefore ITM will net you 60 bucks under that scenario but indeed you were paid 100 for the contract. You shouldn’t comment on things you obviously know nothing about. Are they accepting clients from Australia? If you are looking for a market with spreads wide enough to drive your truck through, and thin liquidity, NADEX is your broker! Hi! I’m interested to put a profit what should I do?? !